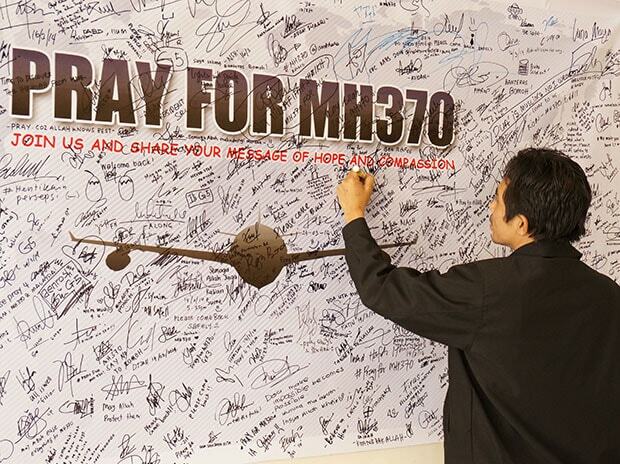 Malaysia is open to restarting the hunt for Flight MH370 if firms come forward with credible leads and concrete proposals, the transport minister said Sunday, five years on from the plane's disappearance. The Malaysia Airlines jet vanished in March 2014 with 239 people -- mostly from China -- on board, en route from Kuala Lumpur to Beijing. No sign of it was found in a 120,000-square kilometre (46,000-square mile) Indian Ocean search zone and the Australian-led hunt, the largest in aviation history, was suspended in January 2017. US exploration firm Ocean Infinity mounted a fresh hunt on a "no find, no fee basis" last year for several months, using hi-tech drones to scour the seabed, but did not locate the plane. Hundreds of people, including some of the relatives of those onboard, gathered at a Kuala Lumpur shopping mall Sunday to mark the anniversary of the jet's disappearance. Only a few fragments of MH370 have been found, all of them on western Indian Ocean shores. Two of those pieces were put on display Sunday for the first time at the memorial. There is no new search planned, but Transport Minister Anthony Loke said at the event that the government was open to hearing proposals to resume the hunt. "If there are any credible leads and any specific proposals, especially from Ocean Infinity, we are more than willing to look at it," he said. Jacquita Gonzales, whose husband Patrick Gomes was a crew member on the flight, said there was "no closure until the plane is found, until we exactly know what happened to the aircraft and our loved ones on board. "It gets tougher every year, because we are all expecting some answers." In a long-awaited final report into the tragedy released in July last year, the official investigation team pointed to failings by air traffic control and said the course of the plane was changed manually. But they failed to come up with any firm conclusions, leaving families of those onboard angry and disappointed.